Software is a critical part of modern research and yet there is little support across the scholarly ecosystem for its citation. Inspired by the activities of the FORCE11 working group focused on data citation, the FORCE11 Software Citation Working Group has published a set Software Citation Principles (https://doi.org/10.7717/peerj-cs.86) in September 2016. This has the goal of encouraging broad adoption of a consistent policy for software citation across disciplines and venues. This presentation will discuss the principles (in brief, importance, credit and attribution, unique identification, persistence, accessibility, and specificity), how they will impact the practice of research, and they can be implemented by researchers, publishers, librarians and others who build and maintain repositories, scholars of science, university administrators, and research funders. In addition, reproducibility of software intensive projects has a set of challenges and obstacles that are different than other projects, and this talk with also discuss the aspects of software that make reproducibility challenging. Mobile Money platforms are gaining traction across developing markets as a convenient way of sending and receiving money over mobile phones. These systems operate on low-cost feature phones and do not require users to have a bank account. These low barriers-to-entry make mobile money platforms excellent tools for financial inclusion of the poor. Additional financial services, such as saving and lending products, are now being offered over these mobile money channels. In this work, we demonstrate how boosted decision trees (Adaboost) may be used to create credit scores (probability of repaying a low-value, short-term loan) for under-banked populations, allowing them to access credit that was previously unavailable due to a lack of financial data. The boosted tree model demonstrated significant results over the original model used by the bank. We show a 55% reduction in default rates while simultaneously offering credit opportunities to a million customers that were given a 0 credit limit in the bank’s original model. Skyler Speakman is a Research Scientist at IBM Research -- Africa. His projects use data science to impact the lives of millions of people on the continent. He believes that data collected through phones and drones will fundamentally change service delivery and African development in the next decade. Skyler completed a Ph.D. in Information Systems at Carnegie Mellon University as well as a M.S. in Machine Learning. He also holds masters in Mathematics, Statistics, and Public Policy. He lives in Nairobi, Kenya with his wife and two young sons. The increase in the importance of Scientific Software motivates the need to identify and understand which software engineering (SE) practices are appropriate. Because of the uniqueness of the scientific software domain, existing SE tools and techniques developed for the business/IT community are often not efficient or effective. Appropriate SE solutions must account for the salient characteristics of the scientific software development environment. To identify these solutions, members of the SE community must interact with members of the scientific software community. This presentation will discuss the findings from a series of case studies of scientific software projects, an ongoing workshop series, and the results of interactions between my research group and scientific software projects. 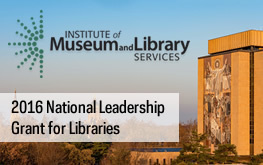 The University of Notre Dame Hesburgh Libraries received a grant from the Institute of Museum and Library Services (IMLS) National Leadership Grants for Libraries Program to conduct a collaborative planning effort to develop an open source Research Data & Software Preservation Quality Tool that addresses a universal need for preserving data and software. As computation is increasingly interwoven with science, today’s researchers can explore and analyze data and possible scenarios more quickly than ever before. The associated software, data, and platforms of these scientific endeavors can foster rapid progress when shared between scientists and information systems. However, preserving and sharing the massive volume of research has become an increasingly challenging effort, and existing solutions are disjointed and vary dramatically across institutions and disciplines. This collaborative project will garner broad institutional and researcher input toward creating a framework of new and existing tools that addresses the critical need for data and software preservation. The Notre Dame research team is led by Zheng (John) Wang, Associate University Librarian for the Hesburgh Libraries. Wang will be supported by co-PIs Richard Johnson, Co-Director of Digital Initiatives and Scholarship, and Natalie K. Meyers, E-Research Librarian, of the Hesburgh Libraries as well as co-PI Sandra Gesing, Ph.D. Computational Scientist, of Notre Dame’s Center for Research Computing (CRC). The proposed Research Data & Software Preservation Quality Tool will allow reuse of preserved software applications, improve technical infrastructure, and build upon existing data preservation services. Additional outcomes include: captured digital workflows and methods, improved data and software provenance, automatically enhanced metadata, and improved file format recognition and data integrity. The planning design allows for input, consensus building, and support from regional, domestic, and international stakeholders. This collaborative approach will ensure that the tool will be flexible to fit a wide range of existing preservation tools and workflow systems. It will also broaden the awareness and adoption of across user communities. “The project promises to strengthen international opportunities for collaborative software development, help like-minded organizations develop solutions across national and disciplinary borders, and empower the research data repository.” said Sandra Gesing. The Center for Open Science (COS) joins the project team as a dedicated partner organization. The center’s role will be focused on reproducibility and interoperable data sharing aspects of the project. COS will also provision and support the project’s use of the Open Science Framework (OSF) to store, share, and collaborate on project components. “Data sharing, access and collaboration among researchers are some of our most important priorities at COS," said Rusty Speidel, Marketing Director at COS. "We are pleased to be involved in developing these critical tools and in furthering the preservation and sharing of open and transparent research." Several organizations are project participants, including: the Scientific Information Service at CERN, The Research Data Alliance (RDA) Interest Group on Virtual Research Environments (VRE IG), RDA Interest Group on Metadata (Metadata IG), the Science Automation Technology Laboratory at the USC Information Sciences Institute, as well as Cal Poly’s Project Jupyter. The project team is pleased to have pledges of participation from the Confederation of Open Access Repositories (COAR), SHARE, DataCite, re3data.org registry of research data repositories, the Digital Research and Curation Center at Johns Hopkins University, Yale Libraries, and NCSA’s Midwest Big Data Hub. Information gathered during the grant-funded work and a detailed project development proposal will be shared transparently using the Open Science Framework (https://osf.io/d3jx7) DOI: 10.17605/OSF.IO/D3JX7 and be archived at project’s end at Notre Dame’s research repository, CurateND (curate.nd.edu). The Hesburgh Libraries is a diverse system of libraries and specialty centers that supports teaching, learning and research at the University of Notre Dame. Digital library services include CurateND and the Hesburgh Libraries’ Center for Digital Scholarship (CDS). The Hesburgh Libraries is committed to the preservation and sharing of research data. Through research, development, and community collaboration the libraries create tools and services that can be reused by like-minded institutions and contribute to local and national efforts that advance open knowledge sharing. Efforts at Notre Dame integrates data management consultation, data curation, and the development of new technologies to serve all disciplines and streamline the research lifecycle. Originally published by Tara O’Leary at conductorshare.nd.edu on December 12, 2016. The National Science Foundation has awarded a consortium of 28 universities, led by Clemson University, a $750,000 grant to fund a Research Coordination Network to set up a national forum for the exchange and dissemination of best practices, expertise, and technologies to enable the advancement of campus-based research computing activities. The project, entitled "RCN: Advancing Research and Education Through a National Network of Campus Research Computing Infrastructures - The CaRC Consortium,” is designed to bring together a wide range of campuses and community stakeholders to form a novel, yet complementary, element of an evolving and expanding national cyberinfrastructure ecosystem. Jarek Nabrzyski, Director of the Center for Research Computing at the University of Notre Dame will lead the efforts at Notre Dame. The project’s initial collaborating institutions are: Arizona State University, Brandeis University, Clemson University, Florida Atlantic University, Harvard University, Kansas State University, Montana State University, Ohio Supercomputer Center, Oklahoma State University, Stanford University, University of California-Berkeley, University of Colorado Boulder, University of Florida, University of Georgia, University of Hawaii, University of Illinois Urbana-Champaign, University of Miami, University of Minnesota, University of Missouri, University of Nebraska-Lincoln, University of North Carolina Chapel Hill, University of Notre Dame, University of Oklahoma, University of Southern California, University of Utah, University of Virginia, University of Wisconsin-Madison, and Yale University. To read the full release visit Clemson University’s website. Notre Dame Research has opened its annual internal grants competition and is now inviting faculty to apply. The deadline to apply is Monday, October 24, 2016 at 11:59 P.M. EST. Faculty Research Support Initiation Grant: This award provides seed funding to established faculty initiating new programs of research, scholarship, or creative endeavor or to new faculty beginning their research programs. The priority for these grants include projects of basic scholarship, research, or creative endeavor appropriate to the applicant's background and academic appointment as well as special projects for which other research funds are not available. Faculty Research Support Regular Grant: This award provides funds to support outstanding research, scholarship, or creative endeavor that will make a major contribution in any field of study. Grants ranging from $25,000 to $100,000 of total funding, as appropriate to the research proposal, over three years are available through this program. Researchers from Indiana University, Purdue University, and the University of Notre Dame will be attending the Indiana Clinical and Translational Sciences Institute (Indiana CTSI) retreat hosted at the University of Notre Dame on Friday, October 21, 2016. During the event, faculty, students, and other researchers will have the opportunity to present posters and hear from colleagues throughout Indiana. In addition, keynote speaker James Inglese, Principal Investigator of the Division of Pre-Clinical Innovation at the National Center for Advancing Translational Sciences, will speak on the design and implementation of assays for chemical biology and drug discovery. Mark Fox, Dean of the Indiana University School of Medicine – South Bend, will also speak at the event.